North Attleboro, 5 @ Attleboro, 6 – Final – Attleboro rallied with four runs in the bottom of the fifth to grab the lead and then held on for a non-league win over North. Alvaro Espinal started the rally when he was hit by a pitch and then came around to score on a Mason Houle double. Lorenzo Wilson plated Houle with a single, followed by a base hit from Robert Furtado. With two outs, Eoin Kelleher singled to bring in both runners and put Attleboro in front. Kelleher (seven strikeouts) also grabbed the win on the mound, retiring the final 10 batters he faced after giving up five runs, all in the fourth inning. North took advantage of a walk, two errors, and a catcher’s interference to put together thr fourth-inning rally, with Kyle Bolger providing the big hit on a bases-clearing double. King Philip, 4 @ Canton, 3 – Final – King Philip earned its third win in the past four games, holding on for a one-run win on the road. The Bulldogs led 3-0 through four innings but the Warriors went ahead with four runs in the top of the fifth inning. David Morganelli went the distance on the hill, striking out three and allowing six hits, one walk, and just one earned run to pick up the win. Zach Zarba and Tim Crowley each had a pair of hits and each drove in a run for the Warriors, while Robbie Jarest had a hit and an RBI. Conor Cooke and Chris Sawyer each had two hits for KP. Canton’s Matt Pigeon went 3-for-3 and senior Paul Corcoran had an RBI for the Bulldogs. Foxboro, 9 vs. Milton, 11 – Final – Foxboro jumped out to a 4-0 lead in the second inning, and then scored three runs in the sixth to tie the game but Milton prevailed in the championship game of the third annual Steven J. Sullivan tournament. Senior Brian Duncan had a team-high three hits and a run scored, Anthony Mollica (three walks, triple, two runs, two RBI), Kyle McGinnis (two walks, two RBI, run, triple) and Adam Lanctot (run, RBI) each had two hits for the Warrior. Franklin, 5 @ Stoughton, 3 – Final – Click here for a recap and photo gallery of this game. Mansfield, 6 @ Milford, 0 – Final – Mansfield held just a one-run lead through five innings of play before plating four in the sixth and one in the seventh to pull away from the Scarlet Hawks. Jake Gerraughty shined on the mound, allowing just one hit while talking two and striking out three in a complete game effort. Offensively, Dan Saraceno went 3-for-3 with an RBI and a run scored while Sam Nugent (run), Gerraughty (run), and Mike Hargadon (run, RBI) each had two hits for Mansfield. Milford starter Colby Pires scattered five hits and three walks with just one earned run over five innings of work. Attleboro, 1 @ North Attleboro, 10 – Final – Bella Erti struck out eight and walked none to earn the non-league win against Attleboro. Emily Nardelli powered the North offense with three hits, including a double and a two-run homer. Abby Gallagher had a pair of hits, including a solo homer, and Ashley Cangiano and Belle Clarkin also added two hits for the Rocketeers, who used a six-run sixth inning to break the game wide open. Annabelle Hebard, Katy Daby, and Emma Bailey each drove in runs for North. Attleboro’s run came on a solo homer by Makenzie Killough. Jenna Gittle also went 2-for-3 for the Bombardiers. Canton, 2 @ King Philip, 15 – Final (5 Inn.) – King Philip’s offense came alive, belting out 14 hits in a win over visiting Canton. Meg Gorman led the way, hitting two home runs and a total of three hits, knocking in four runs. Kara McWhinnie added a home run and a double, and Faith Turinese, Paige Berdos and Reagan Simeone each had a pair of hits for the Warriors. Turinese was strong in the circle, allowing only three hits striking out eight and no walks in five innings. Liz Bickett and Steph Trendell each had solo homers for the Bulldogs. Foxboro, 16 @ Oliver Ames, 3 – Final (5 Inn.) – Foxboro scored five runs in the top of the first and never looked back, taking control of the game with an eight-run third. Nicole Theriault had a big day with three hits and three runs scored for the Warriors. Chelsea Gibbons and Camryn Willis also scored three times in the win, while Alexandra Willis had a pair of hits and a pair of runs. Morgan Sylvestre scored twice and Maria Dunn drove in a pair. Grace Simone (RBI), Kayla Georgeu, Abbi Holmes (run) and Kalei Clark (two runs) each had hits for OA. Clark scored 2 runs, Holmes scored a run. Emma Varella added two RBI for the Tigers. Stoughton, 1 @ Franklin, 13 – Final (5 inn.) – Click here for a photo gallery of this game. – Franklin got off to a strong start, scoring five runs in the first inning and four more in the second to beat Stoughton. Junior Sarah Jackson launched a two-run home run to highlight the Panthers’ big first inning. Ally Shea went 4-for-4 (courtesy runner Molly Collins scored three runs), Gabby Colace had three hits and two RBI, and Maddy White added two hits and two RBI. Jackie Cherry allowed just one run on two hits, walking two and striking out three in four innings of work to get the win. Nikki Coppola had a solo home run in the second inning for the Black Knights. Milford, 0 @ Mansfield, 18 – Final (5 Inn.) – Sarah Cahill allowed only one hit and struck out eight to earn the five-inning shutout for the Hornets. Mansfield jumped out to a 6-0 lead after one, tacked on a run in the second, four in the third, and then seven in the fourth, while pounding out 11 hits as a team. Megan Letendre and Ashlyn Conley each had a pair of hits and each drove in a pair of runs. Nine Mansfield batters had at least one hit in the game. Sharon, 0 @ Taunton, 18 – Final (5 inn.) – Taunton scored eight runs in the first inning and never looked back in a while over visiting Sharon. Sophomore Hanna Aldrich paced the offense with a pair of home runs and five RBI, sophomore McKenzie McAloon added a pair of hits and two runs scored, sophomore Tayah DaCosta had two hits, scored three runs, and two RBI, junior Abbie McDonough had a double and two RBI, and sophomore Skylar Rheaume added a hit and an RBI. Alexa White earned her second win of the year, allowing just one hit in three innings of work while striking out six. Freshman Olyvia Mendonca did not allow a hit in two scoreless innings of relief. Foxboro, 7 vs. Marshfield, 5 – Final – After falling behind 4-1 at the end of the first quarter, Foxboro’s defense put a lock on the Ram attack. The Warriors shut Marshfield out in the second quarter, cutting the deficit to 4-3 at halftime, and then allowed just one second half goal, scoring four of their own to get the victory in Chowda Cup action. The Warriors used a balanced attack with Pete Conley scoring twice and Charlie Baughan (assist), Aidan Stapleton (assist), Bobby Yerardi (assist), Shayne Kerrigan, and Nick Penders each scoring once. Foxboro coach Matt Noone said the Warrior defense played awesome in front of goalie Matt Tully (11 saves). Franklin, 9 vs. St. John’s Prep, 10 – Final (2 OT) – Franklin had a lead and possession with under a minute to go but St. John’s Prep got the ball back after a save and scored with 16 seconds left and went on to win in double overtime. Owen Palmieri had three goals, Jake Davis added two goals and an assist, and Matt Lazzaro scored once and had two helpers. Will Davis made 17 saves in net for the Panthers while senior Jacob Alexander won 15-of-23 faceoffs. King Philip, 9 @ North Attleboro, 7 – Final – Colin DeVellis scored four goals and recorded two assists to lead the Warriors to a non-league road win. KP also got two goals and an assist apiece from Andrew Sajdak and Sam Mattson. Robbie Tartaglia scored the other goal, Chris Longobardi won 12-of-17 face-offs, and Andrew McKinney made 12 saves for the Warriors. Oliver Ames, 16 @ Bellingham, 2 – Final – OA had seven different scorers, led by Hunter Costello’s five goals, to stay unbeaten through six games this season. Cullen Gallagher had a strong game defensively in his LSM role and also popped up with a pair of goals on the other end. The Tigers defense was led by Shane Murphy, Matt Saba, and Tyler Campbell, who held Bellingham to just two scores. Sharon, 13 @ Oliver Ames, 9 – Final – It was a one-goal game at halftime, but the Eagles used a 7-4 second half to pull out the non-league road win and extend their win streak to five games. Emma Eberhardt scored six times for Sharon and also pulled down 15 draw controls. Mia Lappen scored three goals and Cass Barbera and Bridget McManus each tallied twice in the win. OA had five players score in the game, led by Olivia Piazza, who had four goals and three assists. Milford, 18 vs. Blackstone Valley Tech, 3 – Final – Milford took an early lead and never looked back, cruising to its third win of the season. Senior Sophia Bucal paced the offense with five goals while Emily Haley, Annie Flanagan, Riley Campbell and Elena Bon Tempo each scored three goals apiece. Senior Stella Amour scored her first career goal for the Hawks. King Philip, 0 @ Milford, 3 – Final – Click here for a photo gallery of this game. – Milford earned a 3-0 sweep over King Philip in the first ever meeting between the programs, winning 25-19, 25-17, 25-18. Milford senior Joao Boaventura was terrific all around, pounding down 18 kills, adding six aces, and finishing with 12 digs. Josh Orellana added 28 assists for the Scarlet Hawks. Jimmy Peterson and Max Armour had three kills apiece for King Philip while Kyle Desrochers finished with 10 digs. Attleboro, 11 @ Oliver Ames, 1 – Final (6 inn.) – Attleboro scored scored once in the second, added three runs in each the third and fifth innings and put the game out of reach with a four-run sixth inning to walk out of Frothingham Park with an 11-1 over the Tigers. Senior Eoin Kelleher shined on the mound as well as at the dish to pace the Bombardiers. He went six innings, scattering four hits and striking out six with one run allowed. He added a double, an RBI, and a run scored offensively while Sam Larkin (two RBI), Tim Callahan (two RBI), and Mason Houle (double, RBI) each had a pair of hits for Attleboro. Canton, 2 @ Stoughton, 4 – Final – Canton jumped out to a 2-0 lead but Stoughton scored four runs, all on two-out hits, over the final three innings to earn the win. The Bulldogs took a 1-0 lead in the top of the second and made it 2-0 in the top fo the fifth. In the bottom half, Robbie Seaman (2-for-3) connected for a two-out, two-run single to knot the score. The Black Knights added two more runs in the bottom of the sixth to take the lead. Sophomore Brady Conlin (2-for-3) led off with a single and pinch-runner Jake Queeney came around to score on a two-out single from Mike Nazzaro (2-for-3). Zak Paquette then knocked in Nazzaro to make it 4-2. Paquette earned the win on the mound, tossing a complete game allowing six hits with two runs (0 ER), two strikeouts, and three walks. Foxboro, 7 @ Milford, 8 – Final – Milford sophomore Carter Scudo put the ball in play and senior Matt Shaver scored from third as the Scarlet Hawks walked off with a win over visiting Foxboro. The Warriors held a 7-6 lead entering the final inning but were done in by three fielding errors in the bottom of the seventh. Scudo finished with a double, RBI, and a run scored while senior Tyler Almeida drew three walks and scored twice. Danny Corsini went five innings on the mound for the Hawks while Nick Marcolini earned the win in relief, allowing one hit and striking out one in two innings of work. Foxboro’s Michael Devlin went 3-for-4 with two runs and an RBI, Brian Duncan added three hits, an RBI, and a run scored, and Joe Cavaleri and Sean Yoest each recorded two RBI for Foxboro. King Philip, 1 @ Taunton, 0 – Final (10 inn.) – Both King Philip starter David Morganelli and Taunton starter Logan Lawrence pitched into extra innings in a terrific pitchers’ duel on Wednesday afternoon. The Warriors were able to string together three hits in the 10th, the last being an RBI single from Morganelli to score Matt Munnafo for the winning run. Morganelli tossed 8.1 scoreless innings, striking out five while allowing five hits and two walks. Chris Sawyer earned the win in relief with 1.2 scoreless innings. Taunton junior Logan Lawrence pitched eight scoreless innings for the Tigers, scattering three hits and two walks while striking out seven. Mansfield @ Franklin – Postponed to Saturday, 4/13 at 6:00. Sharon @ North Attleboro – Postponed to a date and time to be announced. Oliver Ames, 2 @ Attleboro, 15 – Final (5 inn.) – Attleboro’s Makenzie Killough had four hits, including a home run, and McKenzie Bergdoll allowed just three hits as the Bombardiers earned a win over visiting Oliver Ames. The Tigers scored a run in each the first and second innings but the Bombardiers’ offense proved to be too much. Killough also had two doubles and finished with two RBI, Kayla Baptiste went 3-for-3 with two RBI, Jordyn Lako had two hits, including a triple and three RBI, Lindsay Perry had a double and two RBI, and Bergdoll added two hits and two RBI at the plate. OA sophomore Grace Simone was 2-for-3 with an RBI and a run scored. Freshman Anna Balestino was 1-for-2 with an RBI while senior Colleen Larson scored the other run for OA. Canton, 4 @ Stoughton, 7 – Final – Stoughton belted out 14 hits on its way its third win of the season, knocking off rival Canton, 7-4. Each player in the Black Knight recorded at least one hit with Karly Estremera leading the way with three. Jordan Lyons, Nikki Coppola and Lexi Baptista each had two hits for the Knights. Nicole Baker had another solid performance in the circle to earn the win. Canton’s Liz Bickett went 3-for-4 with a triple, a pair of singles, and two RBI for the Bulldogs. Foxboro, 21 @ Milford, 5 – Final (5 inn.) – Riley Martignetti had three hits and drove in five runs and freshman Peyton Feldman had three hits and three RBI from the lead-off spot to power Foxboro to a big win on the road. Camryn Willis also had three hits for the Warriors, while Morgan Sylvestre went 2-for-4 with two RBI. Emma Rohan went the distance in the circle to get the win. Foxboro coach Mark Maguire called it a complete team performance, as Foxboro got contributions throughout the lineup and all nine starters recorded at least one hit. Milford sophomore Carly Ferreira went 2-for-2 with two RBI, two runs scored and two triples while junior Amanda Wenckus smacked a two-run home run for the Hawks. Franklin, 11 @ Mansfield, 6 – Final – Mansfield scored three runs in the fifth and one in the sixth to cut Franklin’s lead to just three runs (8-5) but the Panthers responded with three runs in the top of the seventh to secure the lead and a win on the road. Franklin jumped out to an 8-0 lead, with Gabby Colace (2-for-2, double, three runs, five RBI) putting the Panthers ahead with a two-run home run in the second inning. The Panthers added five runs in the second and one in the fourth for the 8-0 advantage. After Mansfield cut it to 8-5 through six innings, Franklin senior Jackie Cherry launched a three-run home run to give the Panthers breathing room. Ally Shea (double), Anna Balkus, Peyton Aronne (two RBI), and Maddy White (RBI, run) each had two hits for Franklin. Mansfield left runners on base in every inning but the fourth, including leaving the bases loaded in the first, third, and the seventh. Ella Verheggen went 3-for-4 with a pair of RBI in the loss and the Hornets also got two hits apiece from Mary Muldoon and Sarah Cahill. Emma Roche came off the bench with her first hit of the year to start a sixth inning rally. North Attleboro, 14 @ Sharon, 3 – Final – North Attleboro junior pitcher Bella Erti allowed just three hits and one walk while striking out 11 to help the Rocketeers pick up a win on the road. Annabelle Hebard paced North Attleboro’s offense by going 4-for-5 with two doubles and four RBI. Ashley Cangiano and Belle Clarkin each had three hits while Emily Nardelli (home run), Katy Daby, Erti, Alex Moulson and Emma Bailey each had two hits. North freshman Mandi Hanewich had a hit, stolen base, RBI, and a run scored. Julia Earley hit a two-run homer for the Eagles in the third inning. Taunton @ King Philip – Postponed to Thursday, 4/11 at 3:45. Canton, 7 @ Sharon, 8 – Final – Click here for a Photo Gallery from this game. 0 The Eagles took control of the game with a 4-0 run in the second half that turned a 5-3 halftime deficit into a 7-5 lead with eight minutes to play. Sharon made a defensive stand over the final minute to keep the Bulldogs out and hold on for the victory. Rowan Barnes had a goal and assist in the first quarter as Sharon jumped out to a 2-0 lead. Tommy Vaughan scored to cut the lead in half and then had a behind the back pass to David Allen for the tying goal early in the second. Vaughan then forced a turnover that led to a Chris Lavoie goal to put Canton in front 3-2, but Dan Lillenfeld responded immediately, catching the Bulldogs in transition, to tie it. In the final minute of the half, Griffin Roach and Matt Martin each scored to make it 5-3. Lillenfeld scored the lone goal of the third quarter to make it 5-4 and the Eagles tied it on a Drew Litner goal early in the fourth. Litner added his second to put Sharon ahead and Lillenfeld secured his hat trick with Sharon’s seventh. Roach got Canton back within one but Zack Waxman scored a man-up goal to double the lead. Vaughan got free for his second goal with two minutes left and Canton had possession in the final minute of the game but Adam Rabb made a big save and the Eagles held on. Milford, 9 @ Attleboro, 8 – Final (OT) – Milford’s Josh Ligor scored the game-winner in overtime to deliver the Scarlet Hawks a dramatic win on the road. Ryan Hazard paced the Hawks’ offense with five goals and an assist while Brendan White scored twice and Mike Demko had one goal. Milford coach Jacob Scordato said Danny Farrell and Jack LeBlanc had great defensive performances in front of Evan Hazard (22 saves). Franklin, 20 @ North Attleboro, 6 – Final – Franklin senior Jacob Alexander won 21-of-27 faceoffs, helping the Panthers control possession in a 20-6 win on the road at North Attleboro. Matt Lazzaro paced the Panther offense with five seven goals and four assists, Jake Davis added five goals, Ben Greco chipped in with two goals and two assists, and Alexander added a pair of goals and assists in the win. Mansfield, 5 @ Oliver Ames, 11 – Final – Mansfield scored the first goal of the game but Oliver Ames rattled off seven straight to take a commanding lead at halftime and never surrendered that advantage. OA junior Shane Kilkelly scored three goals and assisted on four more while Colin Bourne had a strong game with four goals. Sam Stevens and Sandro Mascierelli each added a pair of goals while Nick Gillis made 13 saves in goal. Mike Reed scored twice and had an assist for the Hornets, Aidan Sacco scored once and had one helper, and Tom Norton and Brad Grant each scored once. Foxboro @ Stoughton – Postponed to Thursday, 4/25 at 3:45. Attleboro, 13 @ Milford, 14 – Final – Annie Flanagan scored five times and Emily Haley added four to lead the Hawks to a come from behind victory. Milford scored the game’s final four goals, including Flanagan’s winner with only 35 seconds remaining. Elena Bon Tempo and Riley Campbell each scored twice for the hosts, Sophia Bucal added one, and goalie Savanna Rosado made critical saves down the stretch to help the Hawks come out on top. Attleboro’s Kyra Lyons scored a game-high 10 goals while Rylee Fontes added two and Sydney DiLiddo added one for the Bombardiers. Sharon, 8 @ Canton, 5 – Final – Rose Wald made nine saves in goal and the midfield collected 13-of-15 draw controls, including a team-high six by Bridget McManus, to help the Eagles hold off Canton in a big Davenport matchup. The Sharon attack clicked today, with five of the eight goals coming off assists. Emma Eberhardt was involved in all eight goals, scoring five and assisting on three others. Jenna Goldstein scored twice, Cass Barbera added one, and Mia Lappen had an assist for the Eagles. Kaitlyn Goyetch scored a hat trick for Canton in the loss. North Attleboro, 3 @ Franklin, 19 – Final – Franklin notched its third win of the season with a big victory at home over visiting North Attleboro. Annie Walsh led the way with five goals and two assists while Kelsey MacCallum scored six goals with one helper. Franklin coach Kristin Igoe Guarino said Hailey Toolin had a strong day in the midfield and on defense with three draw controls. Oliver Ames, 9 @ Mansfield, 15 – Final – Click here for a photo gallery of this game. – Mansfield pulled away in the second half to earn the Kelley-Rex division win. The Hornets led 7-5 at the half and just 9-8 early in the second half but closed the game on a 6-1 run to seal the victory. Katie Garvin scored seven times for Mansfield and Hayleigh Crawford added four. Katie McCarthy made three saves in the win and the Hornets got strong play on draw controls by Lauren Whitman. Maddie Kullen had a big game for the Tigers to keep the game close and head coach Nicole Lang rued OA’s inability to capitalize on the offensive opportunities it created. King Philip, 19 @ Taunton, 7 – Final – Nine different players scored for the Warriors in a big road win. Caroline Klim led the way with five goals and Dana Truini added four for KP. Ali Wilson had two goals and Jessica Sullivan scored twice and assisted on a third, while Victoria Tormey and Jenna Hitchen each scored once. Three players scored their first varsity goals for the Warriors. Haley Izydorczak had her first two goals and an assist, Lily Brown scored her first goal and had an assist, and Julia Marsden opener her varsity account with a goal as well. Stoughton, 2 @ Canton, 3 – Final – Canton freshman Suraj Ramanathan won his third match of the year at first singles, picking up a 6-0, 6-4 win to pace the Bulldogs to a win over Stoughton. Sophomore Minh Duong added a 6-1, 6-0 win at second singles and the team of Tyler Duffy and Justin Luk were winners at second doubles won 6-1, 6-4 at second doubles for the Bulldogs. Stoughton freshman Anish Sinha won 3-6, 6-3, 12-10 at third singles while the team of Hassan Khan and LJ Ferrandiz secured a 6-0, 6-2 win at first doubles. Milford, 1 @ Foxboro, 4 – Final – Foxboro earned a pair of wins in both singles and doubles action to pick up a 4-1 victory over visiting Milford. Sophomore Jason Kandula won 7-5, 6-4 at second singles and freshman Bo Canfield earned a 6-1, 6-4 decision at third singles for the Warriors. The team of senior Brian Gardner and junior Sean McAvoy won 6-0, 6-1 at first singles while junior Noah Hicks and sophomore Justin Neale prevailed 6-1, 6-0 at second doubles. Milford’s Brendan O’Shaughnessy won 7-6 (3), 6-7 (4), 10-5 in a hard fought match at first singles. Franklin, 3 @ Mansfield, 2 – Final – Click here for a photo gallery of this game. – Franklin swept doubles play and earned one more win in singles action to edge Mansfield at Memorial Park. Rohan Herur was the lone singles winner for the Panthers, earning a 6-0, 6-1 win at second singles. The team of senior Saketh Saripalli and freshman Vayshnav Malhotra won 6-0, 6-2 at first doubles and juniors Shoyaib Shaik and Shoumik Sompally prevailed 7-6 (3), 7-5 at second doubles. Mansfield’s Luke Nickerson won 7-5, 6-1 at first singles and Nilay Pangrekar scored a 6-0, 6-4 win at third singles. North Attleboro, 1 @ Sharon, 4 – Final – North Attleboro sophomore Jonah Manso prevailed in a three-set match at first singles but Sharon picked up wins in the other two singles matches while sweeping doubles play. Junior Alberto Olivei won 6-0, 6-0 at second singles and freshman Rueman Bhattacharyya secured a 6-4, 6-1 victory at third singles. Sharon’s Max Brody and Max Chen earned a 6-3, 6-0 win at first doubles while Alex Aspel and Jake Ross prevailed 4-6, 7-6, 7-5 in a tight match at second doubles. Manso won 7-6, 1-6, 6-1 at first singles for Big Red. Taunton, 0 @ King Philip, 5 – Final – King Philip won all five matches in straight sets to secure a sweep of visiting Taunton. Marco DiStefano won 6-1, 6-0 at first singles, Nick Putney earned a 6-3, 6-1 win at second singles, and Jack Cannon didn’t drop a game in a 6-0, 6-0 decision at third singles. The team of Nate Ihley and Zak Ryan secured a 6-0, 6-0 win at first doubles and the team of Jake Mager and Tyler Dowd prevailed 7-5, 6-3 at second doubles. Attleboro, 1 @ Oliver Ames, 4 – Final – Oliver Ames swept singles play and added one more win from doubles action to pick up a victory over visiting Attleboro. Senior Sarah Leger battled back to win 4-7, 6-2, 11-9 at first singles, junior Maura Kiernan earned a 6-2, 6-4 win at second singles, and Kate McCormick picked up a 6-4, 6-1 win at third singles. The team of Sarah Barron and Morgan Vasiliou won 6-2, 6-4 at second doubles for the Tigers. Attleboro’s Nicole Matheson and Lauren Anthony won 6-0, 6-3 at first doubles. Canton, 5 @ Stoughton, 0 – Final – Canton picked up a win on the road over Stoughton, winning all five matches in straight sets. Rachel Kupferman didn’t drop a game in a 6-0, 6-0 win at first singles, Natalie Keppler picked up a 6-1, 6-0 win at second singles, and Sarah Hernandez earned a 6-2, 6-1 win at third singles for the Bulldogs. The team of Stelina Michaelidis and Jamie Cree won 6-0, 6-0 at first doubles while Kiara Cerruti and Lily Hazam secured a 6-1, 6-3 victory at second doubles. Foxboro, 5 @ Milford, 0 – Final – Foxboro continued its unbeaten start to the season with a sweep on the road at Milford. Pam Nelson didn’t drop a game in a 6-0, 6-0 win at first singles, Sarah Prag prevailed 6-3, 6-4 at second singles, and Maggie McAuliffe earned a 7-5, 6-2 win at third singles for the Warriors. The team of Kendall Milender and Paige Krockta secured a 6-3, 6-4 decision at first doubles while Kethry Milne and Neha Jammula won 6-2, 6-1 at second doubles. Mansfield, 5 @ Franklin, 0 – Final – Mansfield picked up its second win of the season with a sweep on the road at Franklin. Senior Lizzy Elsner didn’t lose a game in a 6-0, 6-0 win at first singles, freshman Kate Martin won 6-1, 7-5 at second singles, and sophomore Aryana Khosravani earned a 6-1, 6-1 win at third singles. The team of senior Hannah Podolske and sophomore Alex Burnham won 6-1, 6-2 at first doubles while junior Tori Detch and sophomore Alex Wendland prevailed 7-5, 6-1 at second doubles. Sharon, 5 @ North Attleboro, 0 – Final – Sharon’s three singles players had a terrific showing, all winning in straight sets without dropping a game in a win at North Attleboro. Senior Nupur Shukla, freshman Valeria Barajas, and junior Makaila Cheung each won 6-0, 6-0 at first, second, and third singles, respectively. The team of Sophia Fein and Sachi Basin earned a 6-0, 6-3 win at first doubles and the team of Lauren Glass and Anjali Jha won 6-4, 6-0 at second doubles. King Philip, 4 @ Taunton, 1 – Final – King Philip won two matches in both singles and doubles action to secure a victory on the road at Taunton. Junior Erin Regnier won 6-1, 6-2 at first singles while sophomore Katarina Schneider picked up a 6-1, 6-1 decision at second singles for KP. The team of Grace Ely and Katie Welch, both juniors, won 6-2, 6-2 at first doubles while sophomores Laura Davenport and Meghan Powers prevailed 7-5, 6-2 at second doubles. Taunton sophomore Jocelyn Pagliuca battled back to win 3-6, 6-4, 10-4 at third singles. Attleboro, 0 @ Mansfield, 1 – Final – Mansfield junior John Carney pitched a complete game shutout and scored the game’s lone run to help the Hornets open the season with a win. Carney allowed just two hits without issuing a walk, striking out six to get the win. In the second inning, Carney singled and moved to third on a double by Eric Longley (2-for-2). Carney then scored the lone run on a passed ball. Attleboro’s Eoin Kelleher only allowed two four hits in 5.2 innings of work, striking out four with one walk. Sam Larkin had a double (and a terrific catch in right field) and Mason Houle had a single for Attleboro. Canton, 14 @ Foxboro, 12 – Final – In a game dominated by offense, Canton prevailed with a 14-12 victory over Foxboro. The Bulldogs scored three runs in each the first, third, and fourth innings, and then tacked on five runs in the top of the fifth to take a 14-5 lead. Foxboro scored two runs in the first, three runs in the third, and rallied for seven runs in the fifth to make it a two-run game. Canton sophomore Steven Burbank went 4-for-5 with an RBI and three runs scored while sophomore Matt Connolly had three hits, three RBI, and three runs scored. Junior Nate Quan added two hits and four RBI for the Bulldogs. Foxboro junior Kyle McGinnis went 3-for-3 with four RBI and a run scored, Michael Devlin was 3-for-3 with two RBI and three runs scored, and Adam Lanctot added two hits, two RBI and a run scored for the Warriors. Phil Thomas pitched three scoreless innings in relief for Foxboro. Franklin, 11 @ King Philip, 1 – Final – Franklin opened its season in style with an 11-1 win on the road against King Philip. Junior Brennan Rivera earned the win on the mound, scattering five hits with no walks over six innings of work. Rivera also struck out three without allowing an earned run. Jack Nally had two hits — a double and a triple — with two RBI and three runs scored while Scott Elliott added three hits, an RBI and a run scored. Alex Haba (RBI, run), Jake Macchi (two runs), Cooper Ross (two RBI), JB Floris (RBI), and Joe Lizotte (two runs) each had two hits apiece for Franklin. Milford, 9 @ Sharon, 0 – Final – Milford went on the road and picked up a shutout win in its first game of the 2019 season. Senior Danny Corsini tossed six scoreless innings, allowing just one hit while striking out six to earn the win. Offensively, senior Matt Shaver went 2-for-4 with a double and two RBI, junior Nick Wimmete had three hits and a run scored, and senior Justin Applebee had two hits, two RBI, and two runs scored for the Scarlet Hawks. North Attleboro, 3 @ Stoughton, 6 – Final – Stoughton junior Jacob Kaplan connected on a two-out, bases-clearing triple in the bottom of the fourth inning to break a 3-3 tie, giving the Black Knights a win over the defending D2 State Champions in the season opener for both teams. Junior George Currier added two hits for the Black Knights. Stoughton senior Zak Paquette earned the win, tossing a complete game with four strikeouts, allowing three runs (two earned) on five hits. Canton, 7 @ Foxboro, 6 – Final – Canton held off a late charge by the Warriors, who got a run in the bottom of the seventh and the tying run in scoring position before Caroline Hughes snared a line drive to end the game. Hughes threw a complete game with a pair of strikeouts, allowing three earned runs. Sarah Kelly went 2-for-4 with four RBI to power the Canton offense and Jackie Morrissey was 3-for-4 with an RBI. King Philip, 0 @ Franklin, 2 – Final – Franklin edged out a pitcher’s duel against the defending league champions thanks to a dominant start from senior Jackie Cherry. She allowed no hits to the potent KP lineup and struck out 10 batters. Cherry allowed only four base-runners, three on walks and one batter reached on an error. Faith Turinese was almost as good for the Warriors, limiting the Panthers to just one earned run. Anna Balkus led-off the bottom of the first with a single, advanced to second on a sac bunt by Gabby Colace and to third on a single by Allie Shea (2-for-3 in the game). Maddy White drove in what turned out to be the game-winning run with an RBI-single. Franklin added a second run in the fifth. Colace doubled to lead off the inning and advanced to third on a groundout, before scoring on a wild pitch. Peyton Arone went 2-for-3 for Franklin and made a pair of great catches in left. Sharon, 12 @ Milford, 7 – Final – Senior Rebecca Clayman went 3-for-4 with a pair of RBI and freshman Savannah Gray went 2-for-4 and drove in four runs as the Eagles beat the defending division champs and picked up their first win under head coach Heather Poliferno. Freshman Trinity Payne pitched in relief, getting out of a jam in the fourth by striking out two and going 3-2/3 innings with 5 Ks. She also went 2-for-4 at the plate and hit a fifth inning homer. Meg Hart had an RBI-triple and Taylor Waldrup had two hits for the Hawks. Stoughton, 1 @ North Attleboro, 2 – Final – Click here for a recap and photo gallery of this game. Taunton, 21 @ Oliver Ames, 1 – Final (5 inn.) – Taunton scored 21 runs on 17 hits in its season opener. Hanna Aldrich powered the offense with a pair of homers, three RBI, and four runs scored. Mckenzie McAloon (three runs), Payton Ceglarski, Riley Murphy (three RBI), and Skylar Rheaume (three RBI) all had two hits for Taunton. Kelsey White earned the win with four strikeouts over three innings with Alexa White and freshman Olyvia Mendonca each taking one inning in the circle. Katie Abreu drove in Emma Varella with a fifth inning double for OA’s lone run. Katie Mills and Colleen Larson each had hits for the Tigers. Mansfield, 5 @ Attleboro, 0 – Final – Mansfield picked up a sweep on the road, winning all five matches in straight sets. Senior Luke Nickerson won 6-0, 6-0 at first singles, senior Luke Devine earned a 6-1, 6-0 decision at second singles, and junior Nilay Pangrekar won 6-1, 6-1 at third singles. The team of Sethu Odayappan and Max Bank won 6-1, 6-2 at first doubles and Sam Donellan and Sam Schirmacher picked up a 6-0, 6-0 victory at second singles. King Philip, 3 @ Franklin, 2 – Final – King Philip’s second doubles team of Tyler Dowd and Jake Mager pulled out a 6-4, 6-7 (5), 6-4 win to give the Warriors a 3-2 win over rival Franklin. The Warriors also got wins from Nick Putney (6-3, 4-6, 6-3) at second singles and Jack Cannon (6-4, 6-0) at third singles. Franklin’s Liam Marr won 6-7 (4), 6-3, 6-3 at first singles and the team of Saketh Saripalli and Vayshnav Malhotra won 6-1, 6-3 at first doubles. Stoughton, 1 @ North Attleboro, 4 – Final – Stoughton sophomore Waseem Sablon won at first singles but North Attleboro won at the other four matches to get the win at home. Junior Alex Pfeffer won 6-1, 6-0 at second singles and sophomore Sam Gallagher earned a 6-0, 6-1 decision at third singles for the Rocketeers. The team of Vikram Senthilakumaran and Saketh Uppuluri pulled out a 6-1, 6-3 win at first doubles while Tomas Bentley teamed up with Justin Strom to pick up a 6-0, 6-1 win at second doubles. Sablon earned a 1-6, 6-3, 10-8 win at first singles for the Black Knights. Taunton, 5 @ Oliver Ames, 0 – Final – Taunton didn’t drop a game at first or second singles as well as first doubles in a win on the road at Oliver Ames. Brett Beaulieu (first singles) and Charlie Fiske (second) each won 6-0, 6-0 while Dylan Kullas earned a 6-4, 6-1 win at third singles. Taunton’s Ryan Hebert and Alex Pugh won 6-0, 6-0 at first doubles. Sharon, 4 @ Milford, 1 – Final – Sharon swept doubles play and earned two more wins in singles action to defeat Milford. Danujan Thirumavalavan (first singles) won 6-2, 6-3 while Ruemon Bhattacharya (second singles) earned a 6-0, 6-1 victory. The team of Max Chen and Max Brody won 6-2, 6-2 at first doubles and the team of junior Jake Ross and freshman Deyan Kassev won 6-0, 6-2 at second doubles. Milford senior Riley Lynch won 6-4, 6-0 at third singles. Attleboro, 3 @ Mansfield, 2 – Final – Attleboro senior Bri Aronne overcame a one-set deficit to win the next two and help the Bombardiers clinch a 3-2 win over Mansfield. Aronne won 2-6, 6-4, 6-2 while the first doubles team of Nicole Matheson and Lauren Anthony won 6-0, 6-4 and the duo of junior Rena Danho and junior Jordan Benardo earned a 7-6 (7-5), 7-5 win at second doubles. Mansfield’s Lizzy Elsner won 6-1, 7-5 at first singles and sophomore Aryann Khosravani picked up a 6-0, 6-2 win at third singles. Canton, 0 @ Foxboro, 5 – Final – Foxboro picked up a win over division rival Canton, winning all five matches in straight sets. Pam Nelson won 6-0, 6-0 at first singles, Sarah Prag earned a 6-1, 6-1 decision at second singles, and Julia Muise won 6-0, 6-0 at third singles. Foxboro’s first doubles team of Kendall Milender and Paige Krockta won 6-1, 6-1, and the Warriors’ second doubles team of Maggie McAuliffe and Lindsey Young won 6-1, 6-2. North Attleboro, 5 @ Stoughton, 0 – Final – North Attleboro earned a sweep on the road, winning all five matches in straight sets. Tara Nair won 6-0, 6-1 at first singles, Mae McLoughlin earned a 6-1, 6-4 decision at second singles, and Jayli Carmichael prevailed 6-1, 6-3 at third singles for the Rocketeers. North Attleboro’s first doubles team of Olivia Willis and Sam Martino won 6-3, 6-1 and the second doubles team of Hayley Strom and Brotiti Nandi didn’t lose a game in a 6-0, 6-0 win. Oliver Ames, 0 @ Taunton, 5 – Final – Taunton defended home court, winning all five matches in straight sets. Jillian Pagliuca (6-2, 6-2), McKenzie Lucie (6-1, 6-2), and Jocelyn Pagliuca (6-1, 6-0) won at first, second, and third singles, respectively. The team of Sam Martin and Briana Fevrier won 6-1, 6-0 at first doubles while Ogechi Ariguzo and Kayla Parrett secured a 6-0, 6-1 win at second doubles. Milford, 0 @ Sharon, 5 – Final – Sharon didn’t drop a single game in singles play, winning all three 6-0, 6-0 and all five matches in straight sets to beat Milford. Senior Nupur Shukla (first), freshman Valeria Barajas (second), and sophomore Charlize Martinez swept singles play for the Eagles. The first doubles team of Sachi Bhasin and Sophia Fein won 6-3, 6-4 while the duo of Lauren Glass and Makaila Cheung won 6-0, 6-1 at second doubles for the Eagles. King Philip, 3 @ Millis, 1 – Final – King Philip picked up its second win of the season, earning a 3-1 (25-20, 26-24, 22-25, 25-9) win on the road at Millis. The Warriors rode the strong serving of Max Armour (11 service points) and Kyle Desrochers (16 service points), both of whom went on big runs at the service line. Desrochers added 10 digs and Alex Bernhard had a strong game with seven digs. Senior middle Jimmy Peterson paced the net defense with seven blocks. Below are the official 2019 Hockomock League Girls Hockey All Stars, selected by the coaches in the league. #14 Taunton, 59 @ #2 Mansfield, 65 – Final – Click here for a Recap and Photo Gallery from this game. #3 Franklin, 59 @ #2 Concord-Carlisle, 43 – Final – Click here for a Recap and Photo Gallery from this game. #12 Woburn, 0 @ #5 Franklin, 3 – Final – Regan Paterson scored a pair of goals and Cassi Ronan added a third, as Franklin knocked off the two-time defending state champs to reach the D1 quarterfinal against No. 4 seed Andover. Amanda Lewandowski had two assists and Paterson, Ronan, and Olivia Stoller each had one. Gabby Colace (18 saves) earned the shutout in goal. Attleboro, 68 vs. Durfee, 55 – Final – Attleboro senior Kevin Velazquez caught fire in the fourth quarter, hitting three three-pointers and scoring 13 of his career-high 24 points to help the Bombardiers pull away and end the regular season with a win. Attleboro led by one after eight minutes, and took a 31-28 advantage over the Hilltoppers into the locker room at half. Junior Qualeem Charles (14 rebounds) dominated the third quarter, scoring 12 of his 16 points in the frame as the Bombardiers created a double digit lead (49-38) going into the fourth. Junior Bryant Ciccio had another strong game for Attleboro with 18 points. King Philip, 49 vs. Falmouth, 54 – Final – King Philip had a bright start but went cold in the final eight minutes, suffering a setback to Falmouth in its season finale. The Warriors led 26-21 at halftime but allowed 20 points in the third quarter and trailed by one (41-40) entering the final frame. KP was held to just nine points in the final quarter. Senior Bruce Saintilus had a team-high 20 points and junior Alex Fritz added 17 points, both players connecting on three three-pointers. Mansfield, 64 vs. Brockton, 57 – Final – Mansfield had a successful day from three-point range, connecting on 14 triples – one shy of the program record – to pick up a win over visiting Brockton. Junior Sam Stevens hit four threes in the third quarter along, the Hornets totaling eight triples in that frame alone, to create the necessary separation. The game was tied at 26-26 at halftime but Mansfield’s red-hot shooting in the third helped the Hornets take a 49-39 lead into the final eight minutes. Stevens finished with five threes total and a team-high 17 points, Tommy Dooling connecting on five threes for 15 points, and sophomore TJ Guy finished with 11 points, including one three-pointer. Damani Scott (seven points) and Matt Boen (seven points, 11 rebounds) also hit threes for Mansfield. North Attleboro, 59 @ Framingham, 54 – Final – Framingham’s Victor Carrillo scored 17 points in the first quarter and had 22 by halftime but the Rocketeers clamped down defensively on the Flyers’ leading scorer, allowing him just four points in each the third and fourth quarters to get a comeback win. Behind Carillo, Framingham led 19-11 after one and took a 33-25 advantage into halftime. North scored 16 points in the third quarter, sparked by eight from senior Nate Gonsalves (14 points) to cut the deficit to 47-41 going into the fourth. In the final frame, senior Josh Montague scored nine of his team-high 19 points, Gonsalves went 4-for-4 from the line, and sophomore George Ladd (11 points) sank a key three to help North pull ahead for the win. Oliver Ames, 70 @ Barnstable, 34 – Final – After an even start, Oliver Ames dominated the second quarter, outscoring the Raiders 32-9 to build a sizable halftime lead that it ever relinquished. The Tigers led by just one, 12-11, after eight minutes but then kicked it into gear, limiting Barnstable to single digits in each of the remaining three quarters. Harry DeChellis scored six of his team-high 13 points in the second quarter, Sean O’Brien (11 points) and Michael Greene (nine points) each hit a three in the second, while Amari Brown (eight points), Jay Spillane, Jake Erlich, and Evan Craig each scored as well. Taunton, 68 @ New Bedford, 56 – Final – Taunton sophomore Danny MacDougall scored seven of his career-high 13 points in the second quarter, helping the Tigers outscore the Whalers 22-8 in the frame to create enough separation for the rest of the way. Tied 14-14 after eight minutes, Wesner Charles (12 points) added six points in the second, Mike Quinn scored five and sophomore Josh Lopes had four to help Taunton build a 36-22 lead by halftime. New Bedford was able to close the gap to nine (44-35) heading into the final quarter but Taunton closed the door with 24 points in the finale frame, including nine from Quinn. Attleboro, 57 @ Durfee, 40 – Final – Attleboro won for the third time in its last four games to end the season on a high. Nyah Thomas was the top scorer for the Bombardiers with 13 points, 11 in the second half, and Jordyn Lako added 11. Hailey Perry chipped in with eight points off the bench in the second half for Attleboro, igniting its comeback on the road. King Philip, 46 vs. Dartmouth, 34 – Final – Emma Glaser led the Warriors with 16 points and Faye Veilleux scored 11 as KP closed out the regular season with back-to-back wins. Mansfield, 43 vs. Bishop Feehan, 22 – Final – The Hornets won the Roundball Classic with a strong second half, earning head coach Mike Redding his 300th career victory. Maggie Danehy scored 11 points and grabbed 13 rebounds and was named the tournament MVP. Sydney Mulkern had a team-high 13 points and Mady Bendanillo scored five points, pulled in six assists, and had four steals. Mansfield led 13-10 at halftime and by eight after three quarters. The Hornets sealed the win by outscoring the Shamrocks 17-4 in the fourth quarter. Milford, 51 vs. Burncoat, 29 – Final – Milford picked up a win in its season finale, knocking off visiting Burncoat. Katie Maietta had a team-high 17 points while Jill Michaelson added 11 points for the Scarlet Hawks. Oliver Ames, 51 @ Norwell, 63 – Final – Oliver Ames and Norwell were tied at halftime (24-24), and the Tigers trailed by just two (42-40) entering the final frame, but the Clippers put together their best quarter in the final eight minutes to outscore OA 21-11. Freshman Caroline Peper had a team-high 15 points while sophomore Caroline Flynn added 12 points, 12 assists, and six rebounds. Taunton, 62 vs. New Bedford, 54 – Final – Click here for a Recap and Photo Gallery from this game. Attleboro, 10 @ Dighton-Rehoboth/Seekonk, 3 – Final – Click here for a photo gallery from this game. – – Attleboro scored five goals in the second period to get a win in the regular season finale over Dighton-Rehoboth/Seekonk. Senior Sam Larkin scored a hat trick, Aidan Diggan and Cam Littig each scored twice, and Kyle McCabe finished with five points, including four assists. Freshman Nick Piazza earned the win in net for the Bombardiers. Foxboro, 3 vs. Blue Hills, 0 – Final – Click here for a photo gallery from this game. – – Foxboro scored once in each period and Espen Reager made 13 saves for the shutout as the Warriors claimed the Dan Jordan Invitational championship. Kirk Leach put the Warriors ahead less than four minutes into the contest, but Blue Hills goalie Brendan Todd (44 saves) made it tough for the Warriors to add to its lead. Sebastian Ricketts fired a wrist shot in with 5:11 left in the second period, and then Ronnie MacLellan (from Leach) iced the game with a power play goal late in the third. Franklin, 2 vs. Marshfield, 1 – Final – Just over a minute after surrendering a shorthanded goal that tied the game, Franklin scored what turned out to be the game-winner with four minutes left in the second period. Just 1:18 after the Rams knotted the score at 1-1, Franklin’s Kyle Hedvig found Tom Tasker, and the junior defenseman buried his chance to put the Panthers ahead 2-1. Junior goalie Ray Ivers had a strong third period to help Franklin secure the win. Junior Shane McCaffrey put Franklin up midway through the first off an assist from Zac Falvey. Franklin, 2 vs. Norwood, 3 – Final – Cassi Ronan and Amanda Lewandowski each scored a goal and had an assist for the Panthers against a Norwood team that needed a point to make the playoffs. Libby Carter also had an assist while Gabby Colace made 18 saves in net. Mansfield/Oliver Ames, 4 @ Whitman-Hanson/Silver Lake, 0 – Final – Jessica Widdop made 26 saves to record the shutout and the Warriors wasted no time, scoring three goals in the first period to sweep the season series against WHSL and qualify for the state tournament. Three different players scored in the first for the Warriors, with Kenzi Fraser, Ella Waryas, and Skyler Sharfman lighting the lamp in the opening period. Lily O’Brien scored in the second on an assist from Emma Pereira. Attleboro, 1 vs. Bishop Feehan, 5 – Final – Click here for a photo gallery of this game. Foxboro, 8 @ Tri-County, 2 – Final – Foxboro senior Brendan Tully recorded five points and Ronnie MacLellan added four points in a win on the road. Tully scored a hat trick and added two assists, MacLellan had three assists and a goal, and Brady Daly, Matt Tully, Tanner Kennedy, and John Watts each scored once for the Warriors. Mansfield, 9 vs. Brockton, 3 – Final – Mansfield scored three goals in the second period to go ahead 5-2 and added four goals in the third period to secure the win over the visiting Boxers. Sophomore Matt Copponi had a pair of goals and three assists, senior Chris Copponi scored once and had three assists, senior Jack Garland scored twice and had one helper, and junior Kevin Belanger finished with a goal and assist for the Hornets. Stoughton, 1 @ Taunton, 5 – Final – Taunton skated to its second win of the season over the Black Knights behind multi-point games from Mike Albert, Dylan Nichols, Cam Sneyd, and Nathan Fernandes. Albert had a goal and two assists, Nichols and Sneyd each scored once and added an assist, and Fernandes finished with two helpers. Seniors Jack Patneaude and Nick Vandermeel each had assists in the win and freshman Ethan Ross added a goal. King Philip, 1 @ Mansfield/Oliver Ames, 2 – Final – MOA’s Skyler Sharfman took the puck the length of the ice before depositing her a shot into the back of the net early in the third period to give the Warriors a win at home. MOA went up 1-0 on a power play goal in the second period when Kenzi Fraser converted a chance with assists going to Isabelle Shanteler and Emma Pereira. KP responded with a power play goal off the stick of Alli Meehan. Sharfman scored the game-winner with 11:17 left in the third period. Taunton, 25 vs. Coyle & Cassidy, 42 – Final – James Collins (106), Christina Balmain (152), Candido Santos (170), Jackson Wellman (182), and Avery Justa (220) picked up wins for Taunton but the Tigers suffered a setback to Coyle/Bristol Plymouth. FRANKLIN, Mass. – One of the best ways to measure how good a team can be is to see how they respond to adversity. 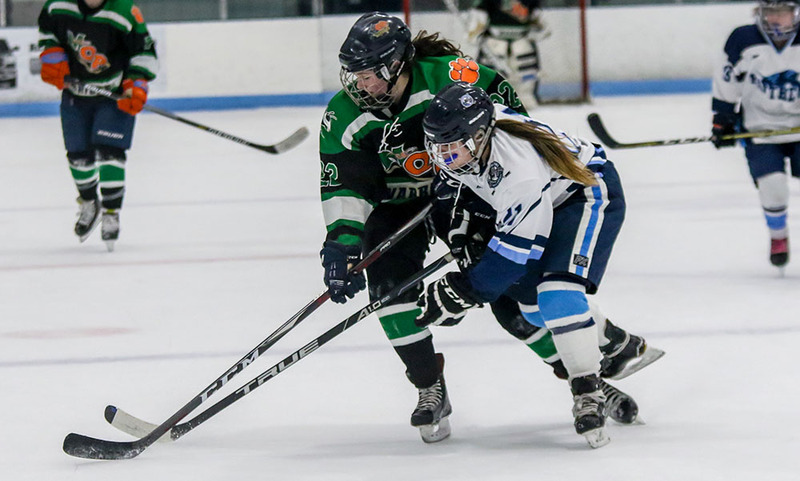 The Franklin girls hockey team suffered its first setback of the season over the weekend at the hands of highly touted Walpole, but the Panthers had no interest in letting that trend continue. Behind a stellar defensive performance, Franklin got back into the win column as it began its second trip through league play with a 4-1 decision over visiting Mansfield/Oliver Ames. The Panthers pounced for a 1-0 lead after the first period before tacking on two more in the second period to earn the win. Franklin limited the Warriors to just 15 shots on goal for the game. Mansfield/Oliver Ames came out with a lot of energy and had some early attacking zone time, but Franklin’s defense was up to the task and thwarted any Warrior attacks before they could turn into scoring chances. The teams traded offensive spells, and there was a good pace to the game as the teams went back-and-forth up and down the ice. It wasn’t until late in the period that Franklin was able to grab the lead. Senior Regan Paterson eluded a defenseman before tossing a shot on net that was turned aside by Warrior goalie Jess Widdop with a pad save. But the rebound popped right to Cassi Ronan and she lifted her backhand attempt under the bar and into the back of the net for a 1-0 advantage. Paterson was awarded an assist on the play, giving her 100 career points. That momentum seemed to carry into the second period, a frame in which the Panthers had the majority of control over. Franklin earned an early power play on a roughing call and didn’t need much time to capitalize. Off the ensuing faceoff, Paterson battled her way between two MOA defenders and then whipped a low shot on net that found the back of the goal for a 2-0 lead, just seven seconds into the man-advantage. The Warriors made a push in the middle of the period with the best chance falling on the stick of freshman Skyler Sharfman, who ripped a hard slap shot but it was blocked by Franklin junior Gina Vignone and cleared out. Franklin added to its lead with just over a minute left in the second period. Ronan jumped in front of an MOA forward to keep possession in the attacking zone, raced in along the boards and then blasted a shot upstairs for a 3-0 lead. The third period belonged to the visitors, who had a lot of offensive zone time. While Mansfield/Oliver Ames had a lot of time in the attacking zone, it couldn’t register a ton of scoring games to go with it. Franklin’s defense did a nice job of preventing dangerous looks on goal. The Warriors finally got on the board with just over nine minutes left in the game. Freshman Sammy Ledin took advantage of a turnover at the blue line and raced in and fired a shot on goal. The first shot was turned aside by Gabby Colace but junior Alex Ledin was in perfect position to bury the rebound. Franklin junior Jordan Dwyer intercepted a pass and scored an empty net goal with just over a minute left to make it 4-1. Franklin girls hockey (5-0-0 Hockomock, 13-1-1 overall) can clinch its first Hockomock League title with a win over Canton on Saturday. Mansfield/Oliver Ames (2-2-1, 5-5-3) will look to bounce back when it hosts Stoughton at 4:10 on Saturday. North Attleboro, 50 @ Attleboro, 68 – Final – Click here for a recap and photo gallery of this game. Foxboro, 45 @ Oliver Ames, 53 – Final – Oliver Ames used a 20-point third quarter to create a double-digit deficit and then held off Foxboro in the fourth to grind out a win at home over the Warriors. After combining for just 10 first quarter points (6-4, OA lead), the Tigers took a 19-12 lead into the locker room. OA then doubled its production from the first half with 20 points in the third with senior Sean O’Brien scoring seven of his team-high 15 points in the frame. Sophomore Amari Brown and senior Ethan Eckstrom each added nine points for Oliver Ames. Foxboro junior Brandon Borde scored 13 of his team-high 15 points in the second half to help the Warriors stay within striking distance. Sophomore Kevin Gallagher added eight points for Foxboro. Stoughton, 60 @ Franklin, 74 – Final – Franklin jumped out to a 22-8 lead after the first quarter and maintained a double-digit advantage the rest of the way. The Panthers led 38-22 at half and 52-31 heading into the final quarter. Senior Jalen Samuels scored a team-high 16 points while junior Chris Edgehill added 13 points, all coming in the first quarters for both players. Will Harvey added eight points for the Panthers, who connected on eight three-pointers. Stoughton junior Myles Grigalunas-Powell had a team-high 14 points while senior Zak Paquette finished with nine points. Canton, 64 @ King Philip, 63 – Final – Canton senior Ryan Lentol converted a traditional three-point play with eight seconds left to give the Bulldogs a one-point win on the road. Lentol converted his shot to tie the game and then hit the free-throw to put Canton ahead. Devin Foster scored a game-high 31 points and had 12 rebounds while Lentol finished with a career-high 16 points. Canton connected on 20 free throws. KP led by as much as 11 in the third quarter but Canton closed the game and trailed just 45-43 heading into the fourth. KP senior Sam Sesay had a career-high 17 points, Tim Nault added 13 points, and Alex Fritz finished with 11 points. Milford, 53 @ Mansfield, 62 – Final – Milford had a three-point lead at halftime, and took a 38-36 advantage into the fourth quarter, but the Hornets poured in 26 points in the final frame to earn the win. Sophomore Matty Boen scored eight of his 11 points in the final frame, Tommy Dooling added six of his 12 points in the fourth, and Damani Scott scored 10 of his 12 points in the second half. Junior Sam Stevens had a team-high 14 points for Mansfield, who shot 27-for-36 from the free throw line. Brendan White had a team-high 17 points for the Scarlet Hawks while sophomore Danny Corsini added 10 points. Sharon, 34 @ Taunton, 72 – Final – Taunton outscored the visiting Eagles 25-3 in the first quarter on its way to a big Hockomock League win. Junior Dante Law scored a team-high 21 points and a total of nine Tigers found their way onto the score sheet. Wesner Charles added 12 points and Naz Kenion finished with 11 points. Sharon’s Ben Kaplan had a team-high eight points. King Philip, 41 @ Canton, 53 – Final – Click here for a Recap and Photo Gallery from this game. Oliver Ames, 57 @ Foxboro, 70 – Final – Click here for a recap of this game. Franklin, 62 @ Stoughton, 36 – Final – Ali Brigham scored a game-high 29 points to lead the Panthers to a big win. Franklin broke the game open in the second half, after leading just 22-16 at the break. Megan O’Connell chipped in with 11 points in the win. Sydnee Hyacinthe was the top scorer for the Black Knights with 18 points. Mansfield, 65 @ Milford, 22 – Final – Mansfield pulled out the big win against a hard-working Milford side thanks to balanced scoring. Ashley Santos scored 10 points for the Hornets, who also got six points apiece from four seniors: Erin Daniel, Emily Vigeant, Abby Sullivan and Alicia Hottleman. Taunton, 43 @ Sharon, 54 – Final – Emma Eberhardt returned after missing the last game with an injury and scored 18 points to help the Eagles pick up an important win. Telishya Herbert added 10 points and Ally Brown chipped in with six to help Sharon hold off a late charge by the Tigers. King Philip, 0 @ Franklin, 3 – Final – Amanda Lewandowski scored a pair of goals and Gianna Cameron added a goal and an assist for the unbeaten Panthers. Gabby Colace (16 saves) earned the shutout in goal. King Philip, 96 @ Attleboro, 74 – Final – Attleboro’s Colton Parkinson was a double-winner, taking first in the 200 IM and the 500 free, and Connor Dunn took first in the 100 free but the Bombardiers lost to King Philip. King Philip, 82 @ Attleboro, 88 – Final – The Attleboro girls swim team set 12 personal bests on its way to a win over visiting King Philip. Liz Saltz won the 200 and 500 free with state qualifying times in both, Jackie Lynch-Bartek took first in the 100 breaststroke, Ella Lynch Bartek touched first in the 100 free, and Tiffany Chin earned first in the 100 backstroke. Those four swimmers teamed up to win the 200 medley relay for the Bombardiers. Brenna O’Connell joined Saltz and the Lynch-Bartek sisters to win the 200 free relay.